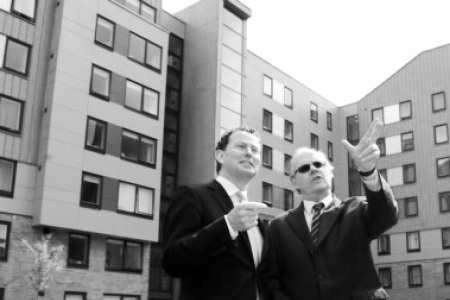 Today Rt Hon Greg Barker, Minister of State for Energy and Climate Change visited The Green student accommodation scheme at Bradford University and was inspired by the project that was completed in September 2011 calling it “environmentally outstanding student housing”. On his trip to the north that included visits to the Green Build Expo in Manchester and Baildon Place homes in Leeds as part of his promotion of the Government’s Green Investment Bank (GIB), he was given a tour of our student accommodation scheme by Vice-Chancellor Mark Cleary and GWP Architecture Director John Wybor. Mr Barker said: “It is a very exciting project because it is pushing boundaries for innovative low-carbon buildings and also doing that cheaper than building a bog standard student development. That shows that low-carbon developments are smashing through economic barriers that have held them back in the past. Gone are the days when low-carbon buildings would be nice to have but expensive. The Green won last years Built Environment – Projects Over £1m category in the Yorkshire Post Environment Awards.